Arthur E. “Art” Amborski was born in Buffalo, New York. He was the only son of Edward and Cecelia Amborski. Their eldest son Herbert, had died in infancy and their middle child, Dorothy was pre-school age when she succumbed to diphtheria. Art attended Burgard Vocational High School and was a four-letter athlete, making the Buffalo Courier-Express All-High teams in baseball and basketball, and winning the Typothetae Watch as the outstanding member of the class of 1943. Amborski went on to play second base for the Newsboys Association in the Municipal Baseball League after high school, but was inducted into military service in September 1943. A sergeant with the Army Air Force, Amborski served as a radio operator/ball turret gunner on a Consolidated B-24J Liberator with the 742nd Bomb Squadron of the 455th Bomb Group, 15th Air Force, making long range strategic bombing missions against enemy military, industrial and transportation targets in Italy, France, Germany, Austria, Hungary, Romania, and Yugoslavia. On June 26, 1944, Sgt. Amborski was aboard B-24J "Rusty Dusty" (#42-99771) that departed from 742nd’s airfield at San Giovanni near Cerignola, Italy, to bomb an oil refinery at Moosbierbaum in Austria. The B-24 failed to return to San Giovanni and Sgt. Amborski and its crew were reported missing. It was not until April 1945, that news was finally received that Sgt. Amborski had been killed when the B-24 was shot down by German fighters and crashed near Neuaigen, Austria. His body was recovered at the crash site and buried in the cemetery at Tulln, Austria before being relocated to the Ardennes American Cemetery in Liege, Belgium in 1947. Arthur Amborski was awarded the Air Medal and Purple Heart. 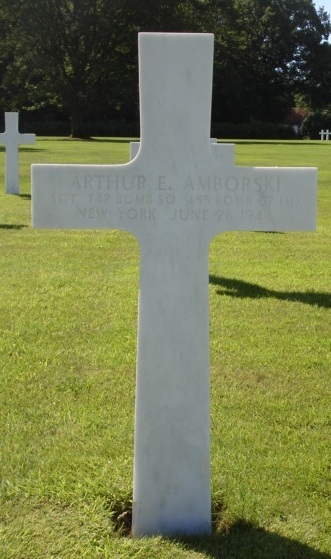 Arthur Amborski's grave at the Ardennes American Cemetery in Liege, Belgium.